Will Mnangagwa's Clean-Up Day Eliminate Trash in Harare? 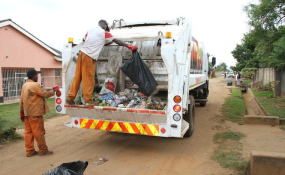 Harare City Council workers collecting garbage in residential areas (file photo). The Environmental Management Agency has lined up activities to raise public awareness on the National Clean-up exercise. Download the full brief here.